In total 175 people died by terrorism attacks last year. In 2004 196 people were killed. In that year 191 people died in the attacks in Madrid. 1988 was the most violent year in Western Europe. 270 people died in the attack on the Pan Am flight over Lockerbie. 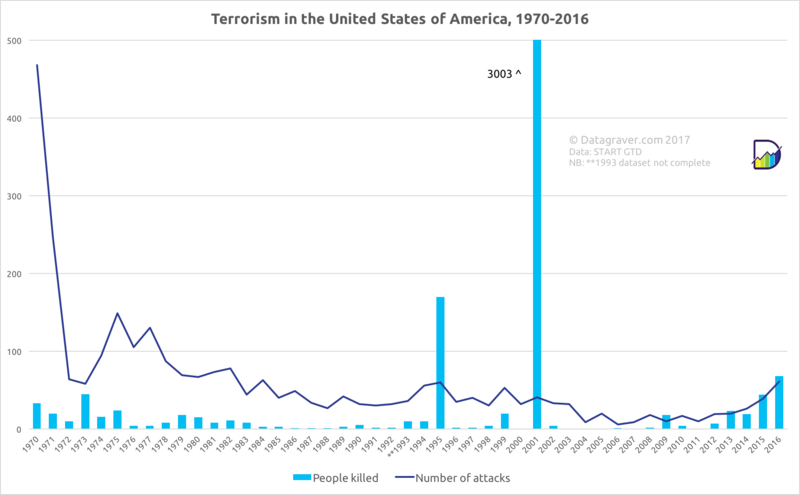 The data for the years 1970-2015 are from the Global Terrorism Database van Start. The data for 2016 is from Wikipedia. Western Europe is defined as:: Austria, Belgium, Cyprus, Denmark, Finland, France, Germany, Great Britain, Greece, Iceland, Ireland, Italy, Luxembourg, Malta, Netherlands, Northern Ireland, Norway, Portugal, Spain, Sweden, Switzerland en Vatican City. Update 21:30: We've added the chart at the bottom. It's an update from a case last year showing the difference between the number of attacks and the number of deaths (impact). 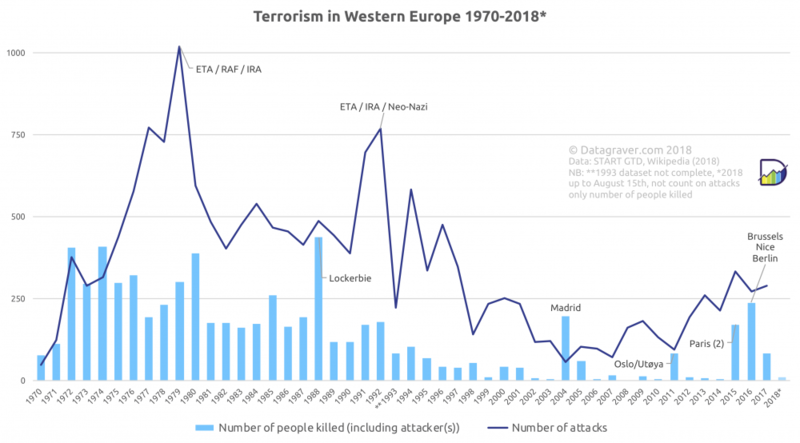 Islamic terrorism has the most impact in Western Europe since 2004 (Madrid). Please take note that 2015 and 2016 data is not verified by GTD. It's our own observational data. Update July 12th: Data from the GTD for 2015 has been released. Graph added. Update July 15th: Updated the chart below to reflect what already happened in 2016 (Brussels/Zaventem, Nice). Be aware the 2016 figures are not verified. Update December 20th 2016: Updated charts at bottom to reflect Berlin attack. Update March 22nd 2017: Updated chart below to reflect London attack. Update May 23rd 2017: Updated charts below to reflect Manchester attack. Update June 5th 2017: Updated chart below to reflect London attack. Update August 21st 2017: Updated chart below to reflect Spain attacks. Update August 16th 2018: Update chart below with latest data. Update July 25th 2016: We've created a version for the USA. The Air India flight 182 that crashed after a bomb exploded in Irish air space in 1985 is not included in the Western Europa data by GTD. In the crash 329 people died.